Continuing from 5 Facts about the Hearsay Rule for Evidence (Pt. 1), below is some additional information about hearsay in criminal cases. Fact 3: For the purposes of the law, hearsay can refer to physical gestures, not just oral statements. Because there are important exceptions to the Hearsay Rule for evidence, it’s crucial that the accused work with Christopher Griffin for the strongest possible defense. In fact, any physical gesture that carries the same weight as an oral statement can qualify as hearsay. This means that gestures like nodding or shaking one’s head, pointing at a person or even shrugging can qualify as hearsay, as these gestures can imply specific meanings, particularly when they are in response to questions about a defendant or crime. Effectively, for the intentions behind such gestures to be able to be admitted as evidence in a criminal case, the person who has made these gestures typically needs to be present in court to testify about his specific intentions, and he also needs to be available for cross-examination by the opposing party. Fact 4: A common exception to the hearsay rule involves the “declarant” being unavailable to testify. He refuses to comply with a court order to testify. He claims he doesn’t remember the statement or subject of the statement. He has a medical condition that prevents him from testifying or from being able to remember his previous statements. Fact 5: When a statement is admitted as evidence, the credibility of the person who made the statement can be challenged. This means that, in addition to the statement being admitted as evidence, other pieces of evidence that can be admitted include statements or conduct that challenge the credibility of the person who made the statement. For instance, if a statement has been admitted as evidence, the criminal record of the person who made the statement may also become evidence because it plays a critical role in establishing the credibility (or lack thereof) of the person in question. The bottom line is that the Hearsay Rule for evidence is very complicated, and there can be aspects of this rule that may be important to strengthening a person’s defense case. 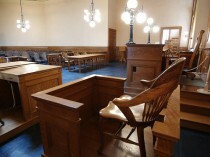 Because a strong defense against criminal charges can be critical to the outcome of a case (and a person’s future), it’s crucial that people accused of crimes have experienced defense attorneys representing them so they take advantage of the aspects of the Hearsay Rule (and other rules for evidence) that are applicable to their case. Facing any type of criminal charges can be both scary and stressful, as a conviction could cost you your reputation, your career, your family and even your freedom. If you or your loved one has been arrested for and/or formally charged with any crime, Christopher Griffin wants you to know that he is ready to immediately start providing you with the strongest possible defense and that he will work relentlessly to help you obtain the best possible outcome to your case.